Wash and pat dry the scallops. Heat the saute pan and add your ghee or butter. Add scallops and cook about 2 minutes on each side until golden but be careful not to over cook as scallops can get tough. Deglaze pan with juice of one lemon. Add scallops back into pan and cover with lemon sauce. Serve with sautéed summer vegetables, brown rice and a side salad for a perfect summer meal. In my opinion, the less one does to scallops the better. Their natural sweetness and subtle flavor need only be enhanced by a touch of salt and pepper and a little lemon juice or wine to deglaze the pan. When thinking about what I would enjoy sipping a Riojan rose with, scallops were a natural choice. Both are light and subtle – a perfect combo. 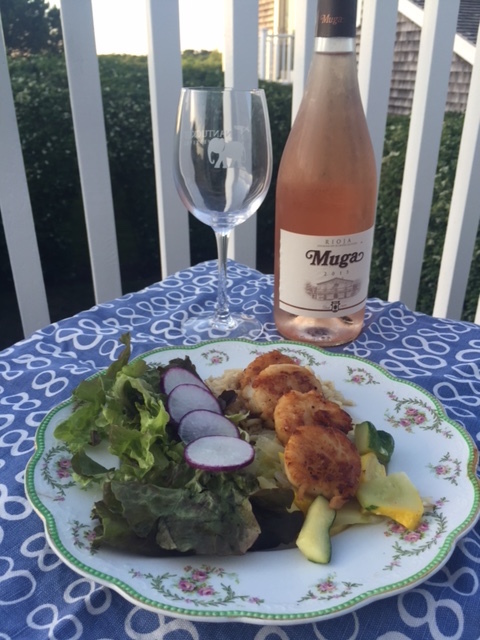 The Muga Rose is a winner – plus it is reasonably priced at $13 bottle. It’s the perfect wine selection to have on hand to enjoy with yummy local goat cheese and crackers or even a plate of linguini and clam sauce. You can also use olive oil instead of butter.